This semi-detached chalet is located in a beautiful holiday park right beside the Kreischberg and a ski lift that lies along the River Mur. The interior has been furnished with a lot of wood, which is well suited to the atmosphere of the house. The beautiful living room with open-plan kitchen has a cosy wood-burning stove and direct access to the patio. The bedrooms are on the 1st floor. 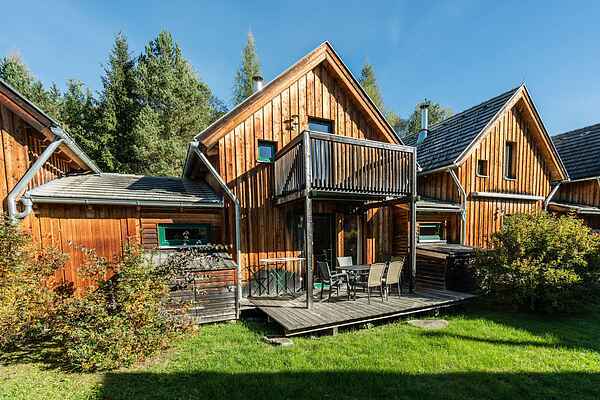 You will definitely feel at home in this cosy wooden chalet. There are spa facilities such as a swimming pool, sauna, solarium and massage parlour in the holiday park. Fun on the slopes starts just five minutes away from the park. The Kreischberg ski area is the second largest in Styria (850m-2,130 m) and because of its wide slopes, it is suitable for both beginners and the advanced. Cross-country skiers will also discover a variety of trails. A 350km cycle route starts from the park and takes you along the Mur. You can enjoy cycling here without any problems. There are hiking trails of various degrees of difficulty. Also, there is a heated pool, a tennis court and football pitch in St. Lorenzen. Whether it is summer and winter, both young and old will enjoy plenty of fun and relaxation at this holiday park.